A case of Zesco Lusaka division. Electricity utilities in Sub-Saharan Africa have been confronted with challenges of meeting electricity needs of their increasing populations and growing economies thereby putting pressure on their generation capacity and existing infrastructure. ZESCO is Zambia’s single provider of electricity which is vertically integrated at generation, transmission and distribution. Following structural adjustment reforms in the early 1990s, ZESCO was commercialized as one of the conditions for the country to attain debt relief from donors. Since its commercialization, the utility has had to contend with inadequacies in its generation capacity due to a sharp rise in demand triggered by resurgent energy intensive copper mining and a growing population. On the other hand ZESCOs transmission and distribution infrastructure has over the years suffered deterioration due to underinvestment owing to low tariffs. Furthermore, inadequate operations and maintenance due to human resource management challenges and below cost tariffs has adversely affected the performance of the utility with regards to the quality of electricity supplied to consumers. 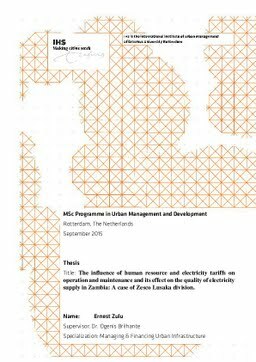 The aim of this study was to explain the influence that human resource and low tariffs have had on ZESCOs operations and maintenance activities and how this has affected the quality of electricity supplied to consumers in Lusaka city. The quality of electricity supply has in part been affected by inadequate generation capacity which the utility has been trying to address by commissioning new power generation rehabilitation and expansion projects in an effort to meet increasing demand. However, most of these projects are long term and will take time to come on board. In the meantime the utility’s distribution and supply network remains constrained and unreliable as it suffers from overloaded lines and transformers resulting in frequent power outages. This research is therefore important as it informs decision makers on key elements of asset management and how this influences quality standards in the supply of electricity. Behavioural and management theories of organizations including the concept of strategic management were used to provide a comprehensive conceptual understanding of how ZESCO operates and provided the framework for analysis.